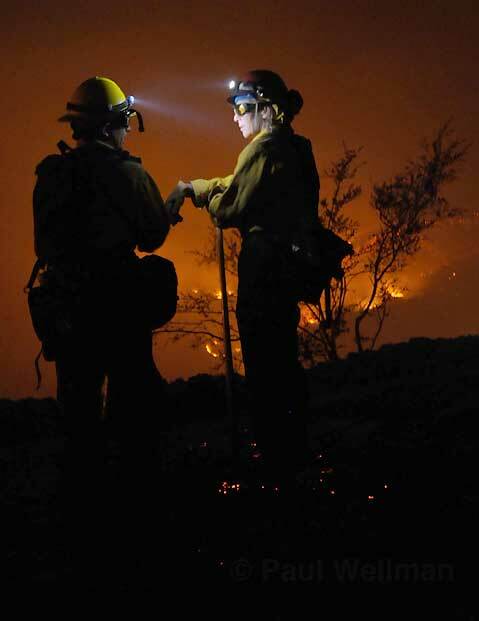 Santa Barbara County Fire Captain Nikki Stevens (right) talks with firefighter Bryon Fernandez (left) about plans for protecting the last house on Spyglass Ridge Road, as the Jesusita Fire burns in the background. Early this morning, Independent reporter Ethan Stewart traversed through the upper Mission Canyon area along Tunnel Road, and said that more than 20 homes have burned (he lost count at 30), though it’s proving hard to distinguish addresses. But compared to the Tea Fire, which Stewart also investigated the morning after, he said that what should be most reported is how many homes were saved, apparently by the diligent work of firefighters. Even in the heaviest hit areas, said Stewart, the burn pattern is more checkerboard and sporadic than the devastation on Coyote Road following the Tea Fire. Stewart said that the upper reaches of Tunnel Road and Spyglass Ridge were the most damaged, along with the trailhead areas. He also got the sense that the inferno had passed through there, and done what damage it was going to do, hopefully not to return. Breezes moving tree branches seem to be coming uphill, he said, though it is also swirling through the area’s streets, nooks, and crannies. Utility trucks and Sheriff’s deputies are on the scene assessing damage. There are firefighters throughout the area, he said, but further down the canyons they are more actively battling spot fires. Stewart had driven up Las Canoas Road from the Mountain Drive side to deliver a much needed can of gas to Independent contributor Sam Kornell, who managed to reach his parents home on Williams Way off of Tunnel Road and Montrose and defend it all night with a garden hose. Kornell had run out of gas, and called on Stewart for a refill. Kornell had been hiking around all morning, and said, “Considering how dense this neighborhood is, it’s absolutely amazing what the firefighters did.” While driving along Las Canoas, Stewart saw lots of fire engines in driveways, and firefighters putting down spot fires. Some houses were lost, but most seemed to be in good shape. Below Skofield Park, the fire appeared to be have stayed on the mountain side of Las Canoas Road. After Stewart passed below the park in Rattlesnake Canyon, he saw evidence of the fire on both sides of Las Canoas road, with some houses still burning and smoldering but apparently under control. St. Mary’s Seminary, at 1964 Las Canoas Road, is fine. Stewart believes that this area of Las Canoas will become a major battlefield today when the south-southeast winds kick back up. Other firefighters he agreed, believing that the fire must be held here to save it from reaching the Riviera. 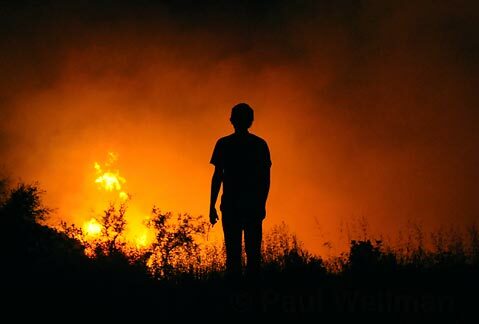 A reporter watches the Jesusita Fire progression on Wednesday night May 6, 2009. As he traveled Las Canoas to Mission Canyon and then turned onto Tunnel Road, Stewart reported burnouts on both sides, getting progressively worse going up towards Spyglass Ridge. Holly Road “looks pretty bad,” he said, and may be the worst hit in addition to Spyglass Road. At least one home is gone on Williams Way. The addresses 1450 and 1455 Tunnel are both gone. [These two homes are on Orange Grove Avenue, though their addresses are both technically on Tunnel.] Also gone is the house at 1454 Tunnel, part of the Rancho Oterada cul-de-sac, which otherwise is standing though other properties sustained some fire damage. A donkey that lives there appears to be fine. Stewart said two or three houses on Montrose Place are destroyed: the two adjacent to 2660 and one across the street from it, that may have been a cottage, though 2660 Montrose itself looked okay. In the Palomino neighborhood, five or six houses are lost. At the very end of Tunnel Road, the home on the right, listed as address 1498 Tunnel, was still standing. Stewart said he couldn’t understand why it was relatively fine, even though there were burned trees in the yard, and the trail itself was “cooked.” He said that was representative of the house-saving that firefighters apparently accomplished throughout the neighborhoods. Lots of reinforcements are coming in, Stewart reported, as there are plenty of hot spots to fight, and everyone is concern about renewed wind activity.